Twenty years ago Feminist.com was just an idea—today it is an ever growing destination for women and people who care about women's issues. 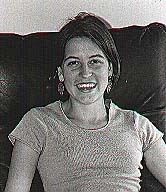 Ask Amy is one part of Feminist.com and since it's inception has been undertaken by Amy Richards. Ask Amy began as something I did unofficially as a way to share some of what I learn on a daily basis - today it is doing that in a more organized and hopefully more effective way. The structure of Ask Amy is such that I'm ostensibly helping other people by sharing resources, listening to their concerns, and connecting them to like-minded individuals. However, I want to underscore how much I get from these interactions. I discover new obstacles, expose new issues, make connections and most important, I feel reaffirmed in the importance of this site. The expertise I bring to this site is the result of endless meetings—meant in only the best sense; constant interactions with inspiring and incredible people who don't yet know they are feminists or those who have been feminists longer than I have been alive; my continual excitement of an organization in the South Bronx that trains women to go from welfare to work or a group of men who are working with other men to stop violence against women - and so much more. When I'm not on-line at two in the morning attempting to sincerely and thoroughly answer each question, I spend my time writing. I have published several books on contemporary feminist issues, including: Opting In: Having A Child Without Losing Yourself (here's an excerpt). Before that I co-authored Grassroots: A Field Guide for Feminist Activism (here's an excerpt) and Manifesta: Young Women Feminism and the Future (here's an excerpt). Over the years I have worked as a consultant to Gloria Steinem, Anna Deavere Smith and the Columbia School of Public Health among other places. That's the part that's paid - or what I refer to as my day job. The other part is being an activist, which means mostly that I help other groups as they try to execute their visions for living in a more just society. I am on the board of Chicken & Egg Pictures, Sadie Nash Leadership Project and Ms. Magazine. I am also a co founder of the Third Wave Fund, which I helped grow from its inception in 1992. My hopes for Ask Amy are simply that people feel that they have a place to ask questions and feel reaffirmed in something they are thinking or feeling. It's format is meant not only to help those asking the question, but others who might have similar questions. So whether you are Asking Amy or not, I hope that you continue to use and value this resource. See great videos of Feminist.com Co-Founder and Ask Amy columnist Amy Richards - and so many others from the Feminist.com community - at the MAKERS site.